CRYSTAL LAKE MEMORIES: THE COMPLETE HISTORY OF FRIDAY THE 13TH. ©Image Entertainment. Inspired by the critically-acclaimed book, “Crystal Lake Memories: The Complete History of Friday the 13th,” is a documentary that takes viewers behind the hockey mask of serial killer Jason Voorhees, available now on Blu-ray and DVD. Written and directed by Daniel Farrands, “Crystal Lake Memories” takes viewers on an epic journey into the making of the landmark horror franchise—from its humble beginnings in 1980 at a New Jersey summer camp to the blockbuster release of its 2009 reboot. Combining hundreds of rare and never-before-seen photographs, film clips, outtakes, archival documents, conceptual art and behind-the-scenes footage, and featuring interviews with more than 150 cast members and crew members spanning all 12 films and the television series, this in-depth documentary is the ultimate tribute to one of horror’s most iconic and enduring franchises. Among the interviewees are: Sean S. Cunningham, Corey Feldman, Wes Craven, Robert Englund, Alice Cooper, Frank Mancuso Jr., Adrienne King, Amy Steel, Ari Lehman, Betsy Palmer, Erin Gray, Kane Hodder, Lar Park Lincoln, Robbi Morgan and Stu Charno. “Marvel’s Avengers: Age of Ultron” is available now on Digital HD. Viewers can watch the blockbuster superhero spectacular wherever they go with Disney Movies Anywhere (DMA), and take a deeper dive into the Marvel Cinematic Universe with the bonus feature “Connecting the Universe,” exclusively on DMA. “Age of Ultron,” released this past spring, has earned more than $1.4 billion worldwide. DMA offers consumers even greater access to their digital collections of Disney, Disney/Pixar, Marvel and “Star Wars” movies at home and on the go with the addition today of retail partners Amazon Video and Microsoft Movies & TV to its robust digital footprint. DMA is already available via iTunes, Google Play, and Walmart’s VUDU, and adds more devices next week as Roku and Android TV come on board. Academy-award winner Eddie Redmayne (“The Theory of Everything”), along with John Hurt (“Tinker Tailor Soldier Spy”) and Jamie Campbell Bower (“Twilight”) are making tracks to the latest Thomas the Tank Engine movie, “Thomas & Friends: Sodor’s Legend of the Lost Treasure.” The kid-friendly animated adventure is available now on DVD as well as a Blu-ray Combo Pack with DVD, Digital HD and Ultraviolet . The feature tells the story of Thomas the Tank Engine and his friends from the Island of Sodor as they embark on an action-packed treasure hunt. 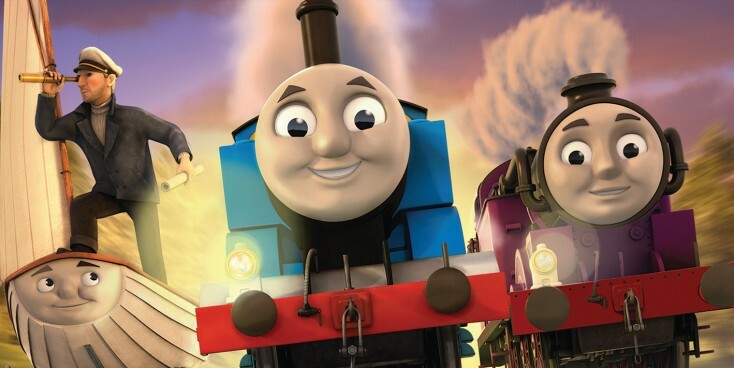 In addition to the star-studded cast, the movie features all-new characters and is premiering just in time for Thomas the Tank Engine’s 70th anniversary. Redmayne voices the character of new engine Ryan while John Hurt assumes the part of Sailor John, and Jamie Campbell Bower is the voice of the trusted sail boat Skiff. Bonus features including two music videos and four all-new Guess Who? puzzles.